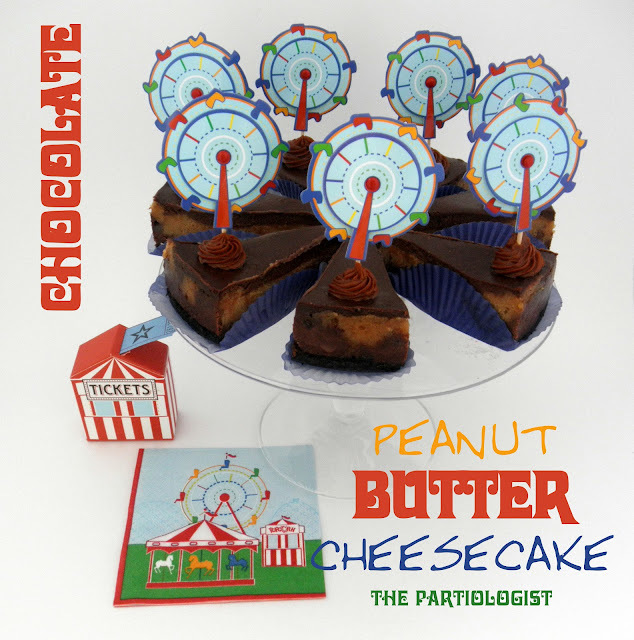 The Partiologist: Chocolate Peanut Butter Cheesecake! This was one of my favorites of the carnival. This and the Hot Diggity Corn Dogs. Chocolate. Peanut Butter. Decadent. Cheesecake. Do you want the recipe? Okay. 1. Preheat oven to 300 degrees F. Combine crackers, melted butter, and 2 tablespoons sugar. Press into bottom and 1 inch up sides of a 9-inch spring form pan; set aside. In bowl beat 1 package cream cheese with electric mixer until smooth. Beat in peanut butter and 1/4 cup sugar until combined. Fold in 1 lightly beaten egg; set aside. 2. In saucepan stir chocolate over low heat until melted and smooth. Remove from heat. Cube remaining cream cheese; add to chocolate. Stir to combine. Stir in milk and vanilla until smooth. Fold in 2 lightly beaten eggs. Spread half the chocolate mixture into pan. Carefully spread all the peanut butter mixture over layer. Evenly spread remaining chocolate mixture. 3. Bake 45 minutes or until top is set when lightly shaken. Outer 2 inches of the top will be slightly puffed and dry-looking; center will look darker and wet. Cool in pan on rack 15 minutes. Use a small sharp knife to loosen crust from sides; cool completely on rack. Cover; chill 4 hours. Let stand at room temperature 15 minutes before serving. Sprinkle with peanuts. Makes 16 servings. 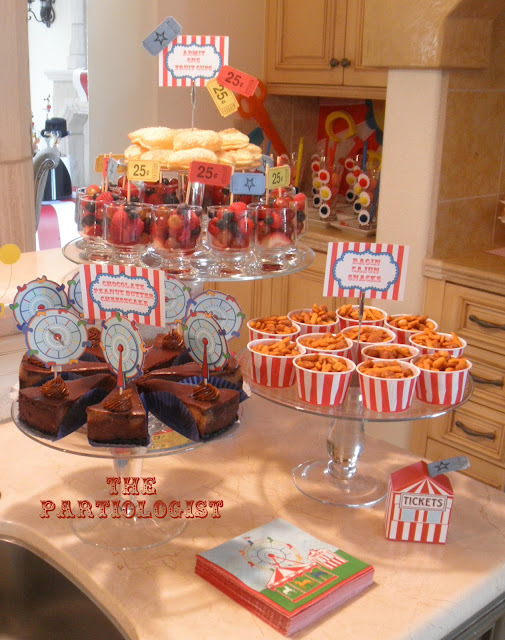 Since the Peanut Butter Cheesecake was SO decadent, I served it along side Fresh Fruit and Ragin' Cajun Snacks. A ticket for the fruit! 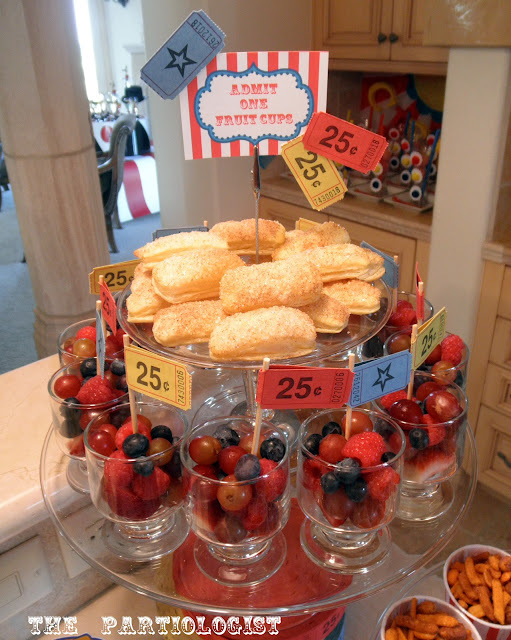 Puff Pastry Cinnamon Sticks were served right along with the fruit. 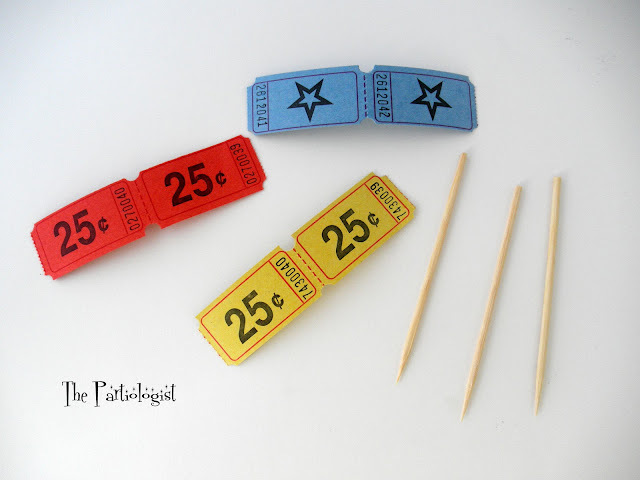 Just glue tickets to the party picks. 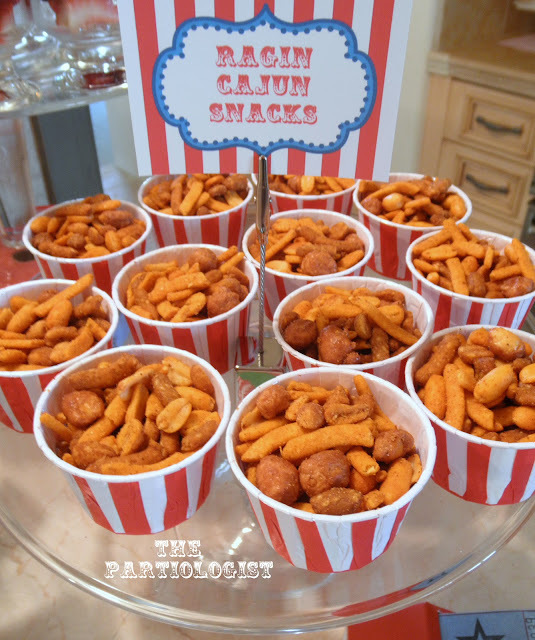 No ticket needed for the Ragin Cajun Snack Mix! More carnival rides to come and you've got a ticket to the front of the line! You are one busy and creative gal! I KNOW I would love this cheesecake! 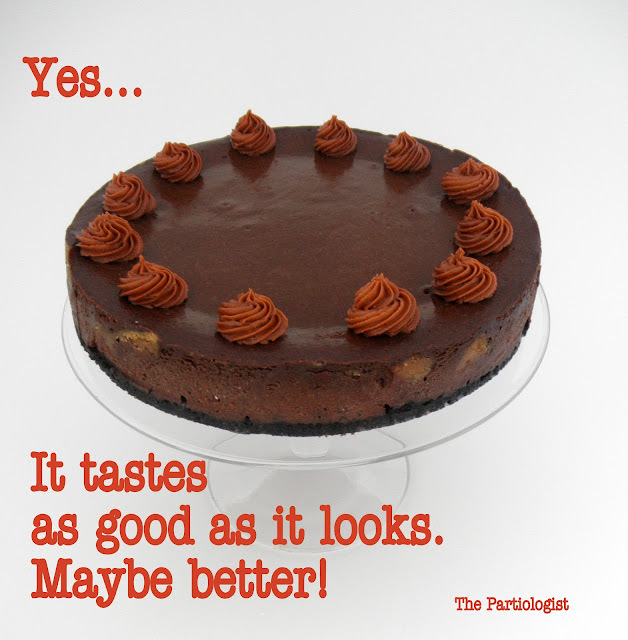 Peanut butter and chocolate....YUMMY!!! This looks so good! Chocolate Peanut Butter Cheesecake?!!! Does life get any better than this?!!! I am drooling!! You may need to double the price of admission because this just blew the roof off your big top!! I love the ticket skewer situation! So creative! The cheesecake looks killer. Wow, nicceeee! I love your creativity. The entire spread looks amazing. One piece of cheesecake and some fruit please. Got my tickets ready.